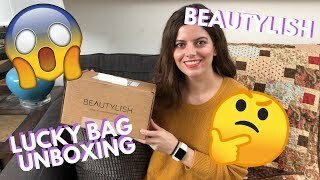 BEAUTYLISH 2018 LUCKY BAG UNBOXING Happy Thursday! Today I am unboxing my Beautylish 2018 Lucky Bag! Who else got a bag, and were you happy with what you received? Thank you for the continued love and support! 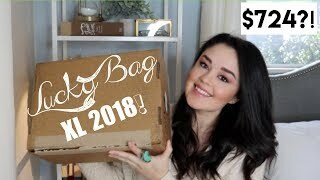 ♥ ♥ ♥Enter My Best of Beauty 2017 Giveaway: https://www.youtube.com/watch?v=jW1lhN7uQHQ&t=1s ♥ ♥ ♥BEAUTYLISH 2018 LUCKY BAG UNBOXING ♥ ♥ ♥ Natasha Denona Body Glow http://go.magik.ly/ml/9182/ Jeffree Star Liquid Lipstick http://go.magik.ly/ml/9183/ Viseart Theory Palette http://go.magik.ly/ml/9188/ Sulwhasoo Sheet Mask http://go.magik.ly/ml/918a/ Wayne Goss #10 Brush http://go.magik.ly/ml/918c/ Smith and Cult Nail Polish http://go.magik.ly/ml/918d/ ♥ ♥Also Watch Will I Buy It Series https://www.youtube.com/playlist?list=PLh4eMv6KTydBgQNxk9g7qKMdY-OSKGU-5 ♥ ♥On Me Dior Forever Foundation http://go.magik.ly/ml/7p0s/ L’Oreal Pro Glow Concealer http://go.magik.ly/ml/9185/ Becca Capri Coast Bronzer http://go.magik.ly/ml/906y/ Burt’s Bees Toasted Cinnamon Blush http://go.magik.ly/ml/9187/ CoverFX Moonlight highlighter http://go.magik.ly/ml/8z96/ Huda Smokey Obsessions Palette http://go.magik.ly/ml/8qxj/ Maybelline Total Temptation Mascara http://go.magik.ly/ml/918f/ Maybelline Truffle Tease http://go.magik.ly/ml/918h/ Benefit Precisely My Brow http://go.magik.ly/ml/918j/ Top – Toploft Clothing Not Available Nails – KL Polish Lumiere https://www.klpolish.com/products/lumiere-colourpop ♥L E T S C O N N E C T ♡♡Insta: @MarchBeautyWord ♡♡Snap Me: @Samantha.March https://www.facebook.com/samanthamarchauthor https://twitter.com/BySamanthaMarch http://chicklitplus.com/ ♥Find my books on Amazon! http://www.amazon.com/Samantha-March/e/B005ZWOGJY Subscribe to my newsletter with the latest beauty news, reviews & giveaways! http://eepurl.com/b0PNZP ♥MY PO BOX! PO BOX 1170 WAUKEE, IA 50263 ♥Discounts, Coupon Codes and Other Fun Stuff! Take 10% off at Sigma Beauty with my code SAMANTHA! http://bit.ly/1ZjTWPy My Sigma Beauty Favorites! http://bit.ly/2yEhfMU Get cash back shopping online with eBates! https://www.ebates.com/r/SJ87R9 Youtubers! Make commissions by linking products in your videos! https://www.magiclinks.org/rewards/referral/samanthama12/ Youtubers! Join Octoly to get free products! https://www.octoly.com/creators?cref=hbgj1 Shop my Amazon Favorites! https://www.amazon.com/shop/influencer-e3dd282f Take 15% off at Krisanna Ann Cosmetics with code MARCHBEAUTY! http://bit.ly/2q70cSR Take 15% off at Fashion Nova with code XOSAMMARCH https://www.fashionnova.com/ Ready to try audiobooks? Get a FREE audio book download from Audible.com! http://audibletrial.com/samanthamarch Get 25% off Patchology sheets masks with code SAMANTHA25! https://www.patchology.com/ Get 25% off Biobelle sheet masks with code MARCH25! https://biobellecosmetics.com/ Get your 2 week free trial with Grokker and get in shape! http://bit.ly/2aCBJvo Get 20% off your next arm candy with Pura Vida Bracelets! Use code SAMANTHAMARCH20! http://bit.ly/2tODZr7 Love receiving free products? Sign up with Influenster! www.influenster.com/r/1154306 *Disclaimer: Some affiliate links used. Most typically Amazon and Magic Links used. Sometimes products used are sent to me from companies, but all opinions are always 100% my own. * This video is not sponsored. 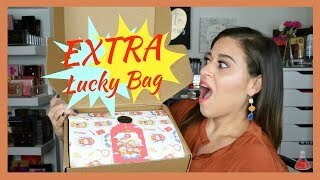 Lucky Bag XL 2018 | $724 Value??! !